ENHANCS DEPTH BY ADDING A BEAUTIFUL MIRROR-LIKE BLACK TO YOUR POND. 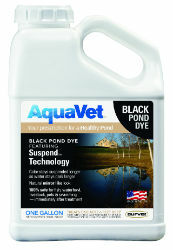 DIAGNOSIS: Requires a shallow water solution that enhances depth by adding a beautiful mirror-like black to your pond. Dosage: 1 LIQUID GALLON treats 1 acre 4-6 ft deep. 1 THROW PACK will treat 1/4 acre 4-6 ft deep. Frequency: Treat every 60 to 90 days for optimum aesthetics and color or whenever necessary after heavy rains.